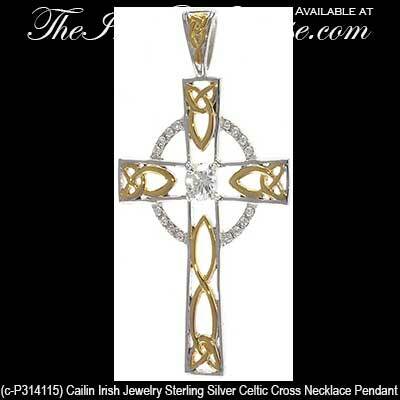 This Celtic cross necklace has been hall marked by the Irish Assay Office in Dublin Castle. This sterling silver Celtic cross necklace is enhanced with gold plated knot-work along with a center CZ stone; the chain bail is also enhanced with an engraved gold plated Trinity knot. The light weight Celtic cross pendant measures 1/2” wide x 1 1/2" tall, including the chain bail, and it includes a 16” long sterling silver chain with a 2" long extender. This Irish necklace is gift boxed with Celtic cross and Celtic knot history cards, complements of The Irish Gift House. 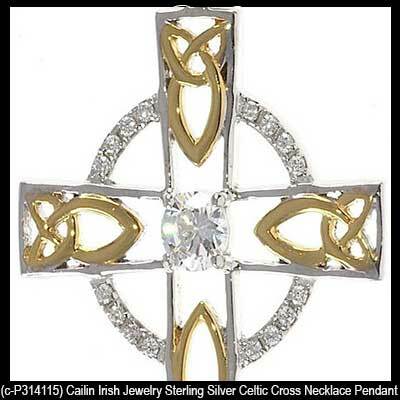 The sterling silver Celtic cross is crafted by Cailin Jewelry in County Kildare, Ireland.